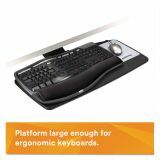 All-in-one keyboard platform with 6" height range, 360° swivel and +10°/-15° tilt. 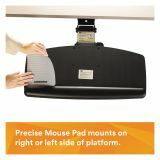 Adjusts to 1/2” above mounting surface and 5 1/2” below mounting surface. 3M Positive Locking Keyboard Tray, Standard Platform, 21 3/4" Track, Black - Economical standard platform holds both mouse and keyboard. Positive locking lever-actuated arm ensures platform won't change height if bumped. Gel wrist rest has antimicrobial product protection that inhibits the growth of microorganisms such as bacteria. Height adjusts +1/-4-1/2". 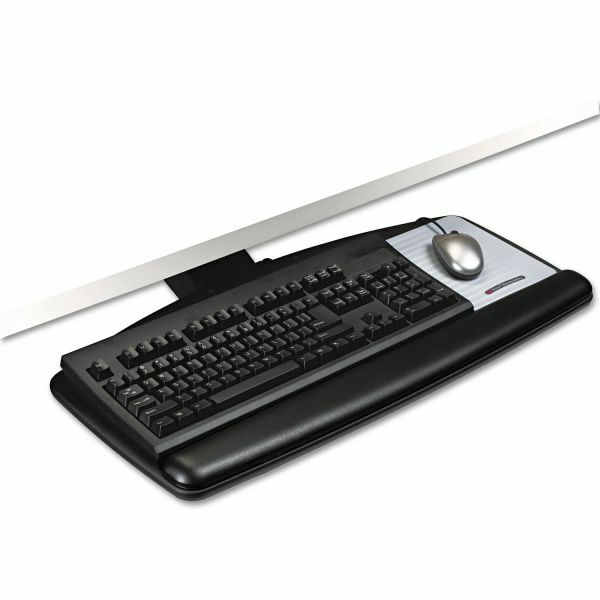 Keyboard tray has a tilt range of +15/-15 degrees, 360-degree swivel and unlimited positions within height range. Mousing surface can be used to the left or right of the keyboard. 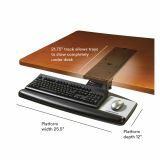 Keyboard tray will work in standard workstations and corner workstations." Precise™ mousing surface extends battery life. 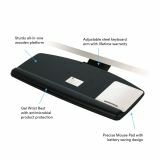 Antimicrobial product protection: Gel-filled wrist rest with antimicrobial protection inhibits the growth of microorganisms, such as bacteria, on the product surface, that can cause stains, odors and product degradation. 6 1/4" x 7 1/2"